Marketing is one-half data and one-half storytelling. Entrepreneurs need to strike a careful balance between these two elements to promote their brand, generate leads, and increase sales revenues. While there are now so many different ways to do this, infographics have continuously remained one of the pillar content marketing materials used by marketers for brand awareness and lead generation. So, what exactly is an infographic? In case you do not know, an infographic is a type of visual content that presents data using a graph, chart or image. Marketers use infographics to simplify what’s otherwise a complex subject or topic so that they’re easily understood by their target audience. 90% of marketers today use infographics as part of their content marketing strategy. Nearly all of them found these to be successful. One reason for this is that infographics can capture a person’s attention quickly and more efficiently. According to Adam Steele, Founder of Loganix Citation Building, people’s attention spans is shorter now because of the volume of information available on the Internet. It got even shorter now with the arrival of smartphones. In fact, the average attention span of a person online is far shorter than that of a goldfish. In a study performed by the Nielsen Norman Group, internet users slow down and pay closer attention to the information presented as images. The more relevant the images and illustrations are to the data, the longer they spend reading through the text included. Another reason why infographics are powerful marketing content materials is that people naturally remember images more efficiently than text. Studies show that people are 65% more able to retain information when an image is paired with text three days after. Despite all the different content marketing trends, infographics will continue to play an essential tool. Below are the seven infographic trends every entrepreneur should be in the know. As mentioned earlier, marketers rely heavily on visual content like infographics for their content marketing strategies. Having that many businesses mean that it is now more challenging to create an infographic that looks unique. The challenge of using infographics is that they end up looking very similar to one another. Using custom illustrations instead of stock photos is one trend that we can expect to happen in 2018. For example, checkout Hired 2018 Global Brand Health Report. You will notice their infographic is interactive and helps set them apart from the others who covered the same topic because the content is presented in an engaging way. Infographics also help establish your brand. When your target audience sees your infographics shared on another site, they automatically remember you. Roundup posts are among the common types of content marketers publish when they suffer from writer’s block. That’s because they’re easier to create, but don’t skimp on the value they provide to their readers. So it should not be quite surprising that marketers are now beginning to do the same with infographics. Using quotes is an easy and efficient way to come up with a stunning infographic that delivers. All you have to do is to choose a quote aligned to your topic, add the picture of the person who said that quote, and you are done. However, for this to work, it is not enough that the quote provides valuable information to your readers. According to Aaron Haynes, Founder of Fenix Pro, the one who said the quote is just as important—if not more important—than the information on the quote you include on your infographic. “Quotes from celebrities, key influencers in your niche, and other famous people are the ones that work best because these are among those that are frequently shared by people on social media,” he explains. Another infographics trend in 2018 is the emergence of dynamic infographics. This type of infographic incorporates GIFs and other moving elements. This kind of infographic is more challenging to create than a static infographic. However, it is going to be worth the effort. Since dynamic content can capture the interest of readers more quickly. At the same time, it can help guide your readers to the rest of the information on your infographic by moving towards that direction. This infographic below shows exactly what I mean. By doing this, you can stop your readers from passively scrolling, and get them to read the details in your infographic more carefully. The use of 3D designs is making its way back into the spotlight. Because of this, you can expect a growing number of infographics featuring 3D illustrations to increase. As you can see, 3D illustrations stand out more than the conventional 2D design elements you see in most infographics. The added depth also makes the illustrations look more realistic, making it even more appealing and engaging. More and more brands are shifting towards using bright—even unconventional—colors in designing their infographics. Not only do they quickly grab your audience’s attention, but they also make the infographic look fun and engaging. Alongside this is the use of fancy fonts, particularly on the title and subheadings. These fancy fonts double up as an additional design element to complete the look and feel of your brand’s image. When using bright colors and bold fonts in your infographic, it is essential to make sure that you do not go overboard because this can cause your infographic to look amateurish rather than trendy. As with any type of visual content, it is important to make sure that you strike that balance between function and design. Using a bold and colorful font against a bright background can make it overwhelming—even painful—to read, which defeats the purpose of your infographic. If you want to use a colorful background, stick to either black or white for the text elements of your infographic. That way, you can capture your audience’s attention without compromising its readability. Color gradients are another design element that is making a comeback as an infographic trend in 2018. That is because they help give a touch of eye-catching color to your entire infographic. It also offers creatives a little bit more freedom when it comes to the infographic’s overall design while still staying within the overall look and feel of your brand. 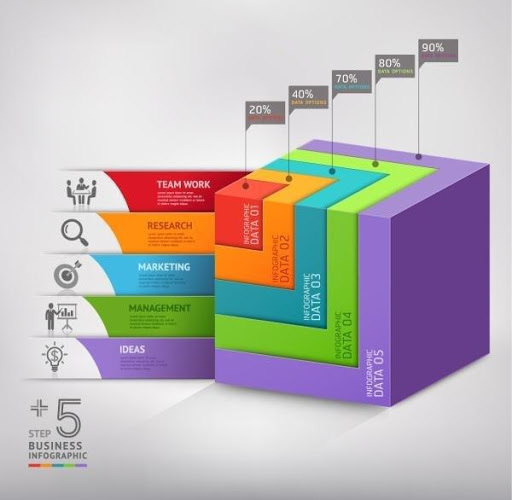 On top of this, color gradients give a subtle 3D effect to your infographic. It is a great hack to use if you want your illustrations to pop and stand out. Right now, most infographics are designed for viewing using desktops and laptops. 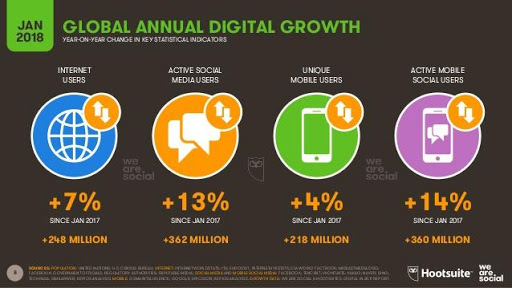 However, with more and more people now using smartphones to go online, 2018 will be the year when content marketers will start creating infographics optimized for mobile devices. One way this can be accomplished is by shortening the length of the infographic. That way, your audience will not have to swipe up the infographic more times than they would like to do so. Another way to make your infographic is to create it vertically. Infographic with a horizontal layout will more likely not fit the screen of a smartphone or tablet unless your reader flips the device horizontally. 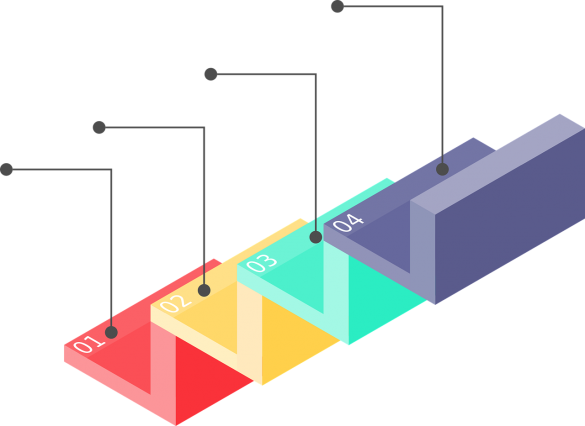 Keeping to the vertical design eliminates this additional step for your reader, increasing the likelihood of them going through the content of your infographic. Infographics today are more than just a fancy piece of content. When designed carefully, an infographic is a powerful tool to help you build your brand and establish your authority in your niche. Each of the trends mentioned here can significantly increase the impact of your infographics to your target reader. Combining two or more of these trends will increase its effectiveness exponentially. Of course, that will only happen if you have the right quality of data and information you share. After all, the primary purpose of creating an infographic is to give valuable information to your readers in an easy-to-digest format. Without this, your infographic will just be another beautifully designed image. Which of these infographics trends are you planning to adopt for your company’s next infographic? Are there any other infographic trends worth mentioning? Share it in the comments below.